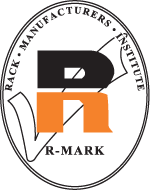 For over 50 years, the Rack Manufacturers Institute (RMI) has been evolving consensus standards for warehouse racks and industrial steel pallet racks, flow rack, and structural rack. In 2002 the industry developed its latest and most comprehensive consensus document RMI 2002 – Subsequently adopted as ANSI MH16.1 – 2004. The document includes seismic design provisions and has been accepted as the default standard for the new International Building Code and NFPA Building Codes.